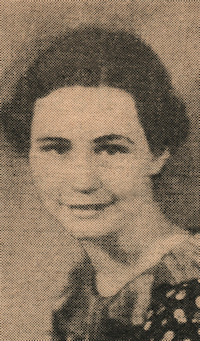 Obituary – Faulkner, Eleanor Louise (Bobbitt) « Perry High School Alumni Association, Inc.
﻿﻿- daughter of Mr. and Mrs. F. B. Bobbitt of Kansas, was born in Perry on Oct. 20, 1919 and attended the elementary grades in Blackwell and Perry. She attended high school in Perry and during her high school career she was a member of the Perry glee club. Following graduation she wants to get a job. Eleanor died in Madera, CA at the age of 81. Eleanor worked in the medical field as an LVN and was a member of the United Methodist Church in Madera, CA. She is survived by her husband, Irvan William “Mr. Mike” Faulkner (09-27-1919 to 12-12-2005) of Madera, CA; three daughters: Glenda Hayes and her husband, Douglas of Denver CO; Shirley Humphries and her husband, Lynn of St. George, Utah; and Joyce Anne Martinez and her husband, Mike of Madera, CA. She is also survived by 13 grandchildren, 39 great-grandchildren and 4 great-great-grandchildren. Funeral services held on September 25, 2001 at the United Methodist Church in Madera, CA with interment at Arbor Vitae Cemetery in Madera.